After the brown box, now i'm in Top 23! I cannot believe myself. Or rather i cannot believe my eyes. Maybe it's the effect of playing too much computer. Or did someone switch my glasses on purpose? 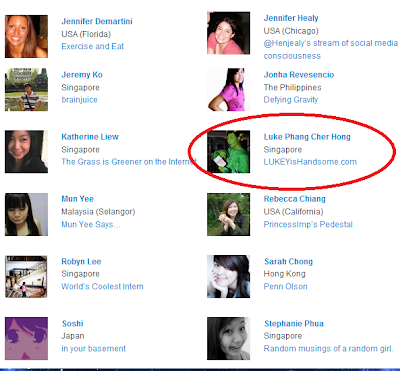 When Standard Chartered Bank announced today the Top 23 shortlisted candidates for one of the most coolest internship job ever with SGD 30 000 as a remuneration, lukeyishandsome.com is one of the pages sitting right there on the Top 23 list! 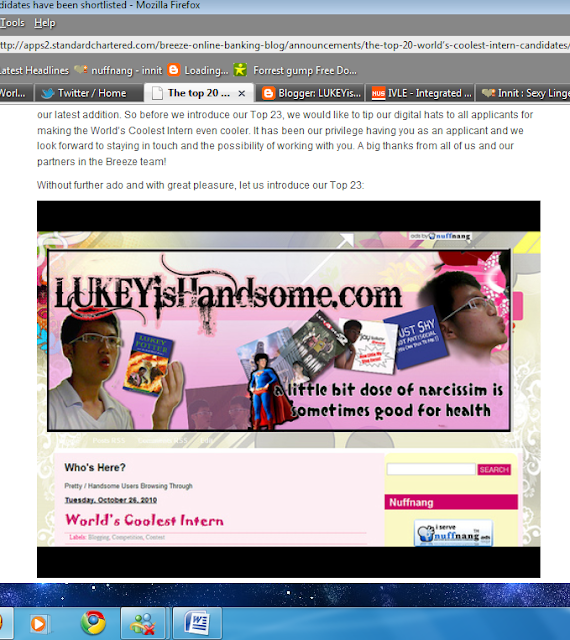 Got preview of my blog some more! Wait, wait, wait. Let me calm down first. I need to assure myself that this is not a dream. Ouch! Okay, i'm not dreaming alright. Besides, I still can see my unfinished 1800 word assignment lying around. If this had been a dream the assignment would have gone too. So, now that i know that this is not a dream, please excuse me for one moment while i go shout around and release this pent up excitement in me. "Wohoooooooooo!!!! Yipeeeeee!!!! Whoaaaaaaaa!!!!!!! I'm handsome!!!!! Bwahahahaha!!" Ahem. Back to the story. Now that i'm in the Top 23, the journey is not going to get any easier though. As part of this round's requirements i'm supposed to Tweet, produce a video and get followers to promote me! I'm fine with Tweeting, i Tweet almost everyday to my friends' annoyance. Producing a video should be a breeze too (no pun intended). Just turn on the webcam, record yourself and say some funny thing like how Shane Dawson does it. I guess that should be fine. But when it comes to asking my followers to promote my Tweets... erm, i guess that's a little bit hard. 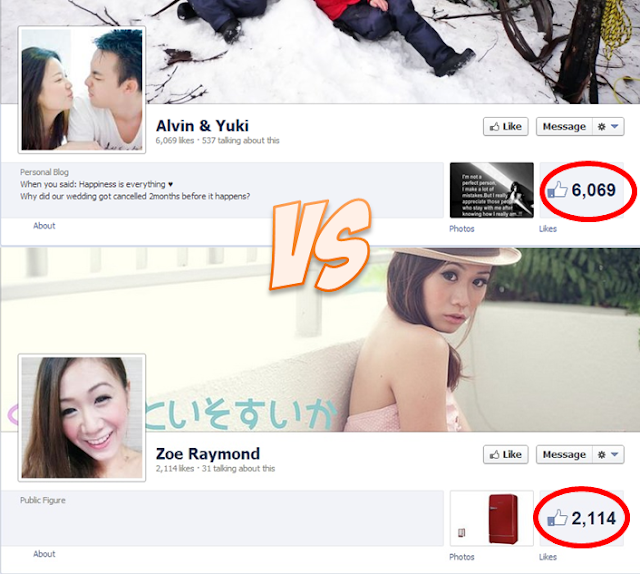 Most of my friends don't Tweet, you see, and i have a miserable 67 followers only in my Twitter. You see, i don't go around asking people to be my followers.Which is not good in situations like this. However, for this competition, i guess i have to do the thing that i rarely do. Asking people to be my follower and support me in Twitter. Yeap, if you happen to be a loyal lukeyishandsome.com reader and have a Twitter account, i would be greatly thrilled if you can follow me at Twitter @ http://twitter.com/dori_lukey. 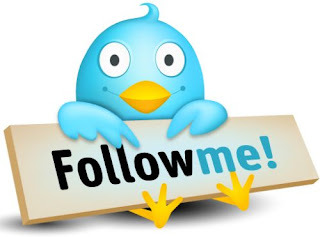 I will follow you back too! I guess that's all for now. 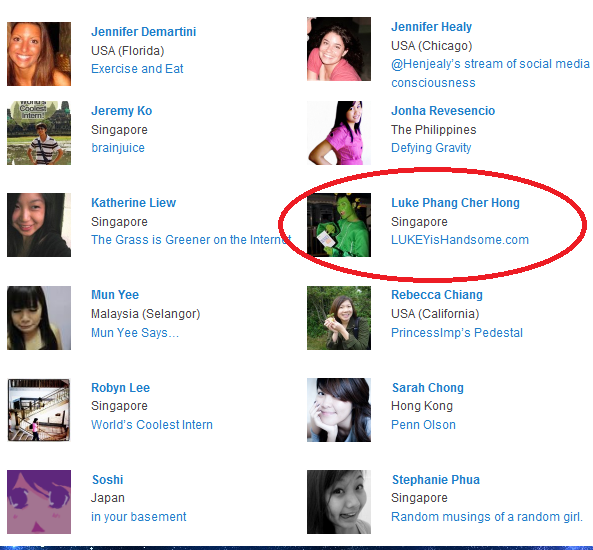 Would really appreciate it if you guys (and girls) could help handsome Lukey in his journey to become a cool intern too. Because if i were to go in guns blazing with the number of followers i have now, the other candidates with 1000+ followers would wipe me out in one shot. Any help would be greatly appreciated! And thanks in advance! Time to think of an awesome overkill Tweet and video!